1 of 3 In medium-size bowl, whisk together soy sauce, vinegar, honey, oil, garlic, ginger, red-pepper flakes, and black pepper. Add chicken wings; turn to coat. Marinate, covered, in refrigerator 2 hours or overnight. 2 of 3 Prepare outdoor grill with hot coals arranged for direct grilling, or heat gas grill for direct grilling. Remove wings from marinade; discard marinade. 3 of 3 Grill wings over direct heat, covered, 6 to 8 minutes per side or until internal temperature registers 180 degrees F on instant-read thermometer. Broiler Method: Heat oven to 450 degrees F. Place wings on rack in broiler pan. Roast for 30 minutes or until internal temperature registers 180 degrees F. To crisp skin if desired, increase oven temperature to broil. 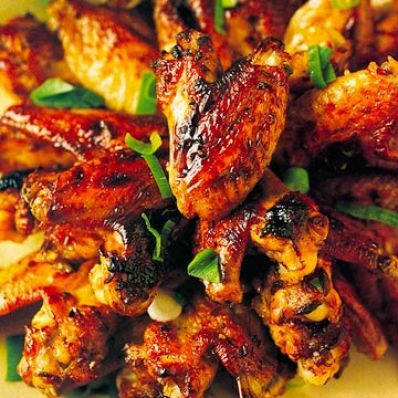 Broil wings for 1 to 2 minutes or until skin is crisp. Makes 8 servings.